Awesome. We owe you a slice. Won't be on the road selling pizza for about a week but we'll email you with your coupon paperwork. WHen does I get my COUPON!!!!?!? Hey Danny, print this post out and present it with your id and we'll give you a free pie. Note to others: When Danny submitted this picture we were offering free pizza to anyone who submitted a picture they took of the truck. 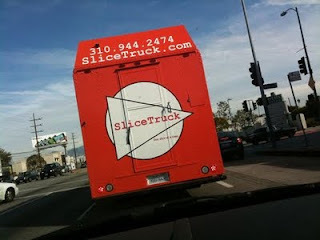 We no longer offer this, you still can upload pics of the truck or the pizza to this site via the contact us link.